Have you been basketballing this weekend? Fun fact…this weekend, the opening weekend of the NCAA basketball tournament, is the most common time of year for males to get a vasectomy. Get snipped and recover with an ice pack placed just perfectly so, basketball on the tube, and a beer in the hand. I find this to be good thinking ahead … a two birds one stone kind of situation. I love me some March Madness. Mostly for the upsets and underdog victories. Even if it blows my bracket to pieces. And let’s be real here… my bracket is a smoldering mass of failure. But…that’s how it goes and if it is blown to pieces because of an upset that has a coach falling on the floor and kids hitting game winning 3’s and fade-aways at the buzzer…I am OK with that. I made some brownies to quell the pain of a few losses –this is the place where it is totally rational and cool to eat our feelings – you know, the picks I made with my heart and not with logic and stats. The upsets I had hoped/planned on and not the actual upsets that took place. While I love a good Cinderella story, I am terrible at predicting them. Go figure. 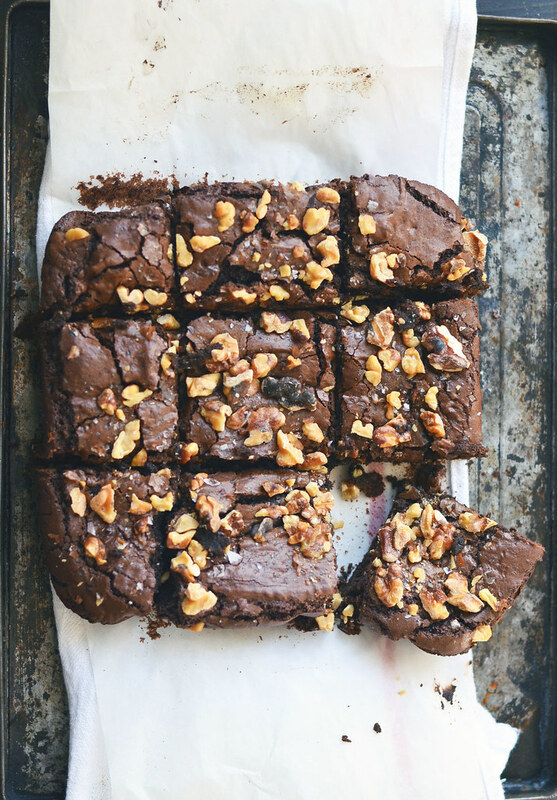 These brownies are thick and fudgy with chewy edges and a crackly top crust. Gosh, the crackly top crust that sticks to your lips like that of a golden thin crispy top layer of a fresh baked croissant. 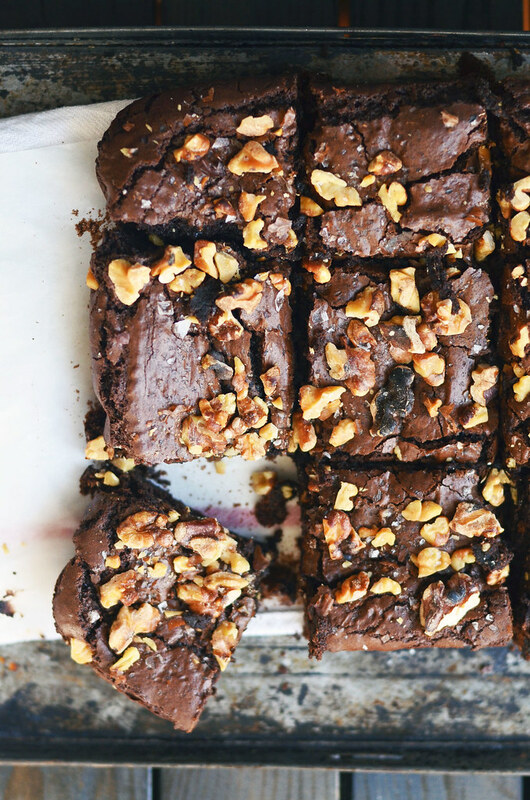 They are everything one asks for in a brownie and more. 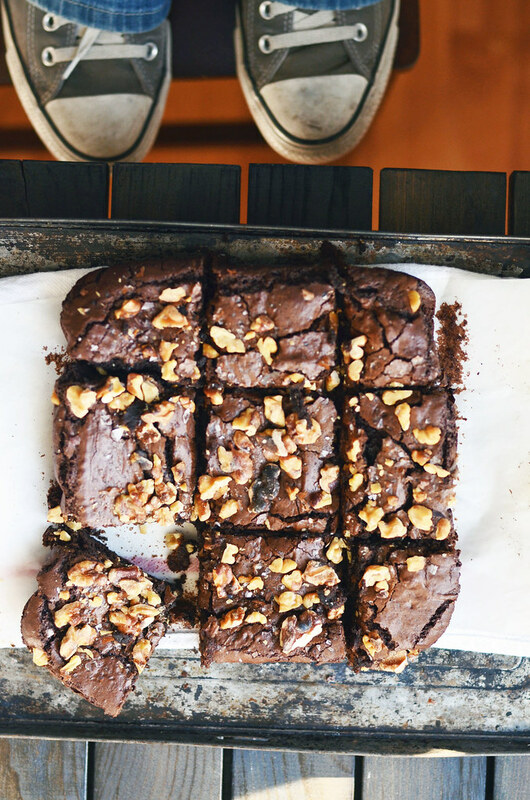 They are my go-to and have been for some time – they are what I compare all other brownie recipes to. So, imagine my surprise when just a few weeks ago, Joy made them as well, but with the use of brown sugar and the addition of baking soda. As you can tell, I really liked the final results and think I will keep the changes, but they aren’t necessary as they are fantastic without. P.S. 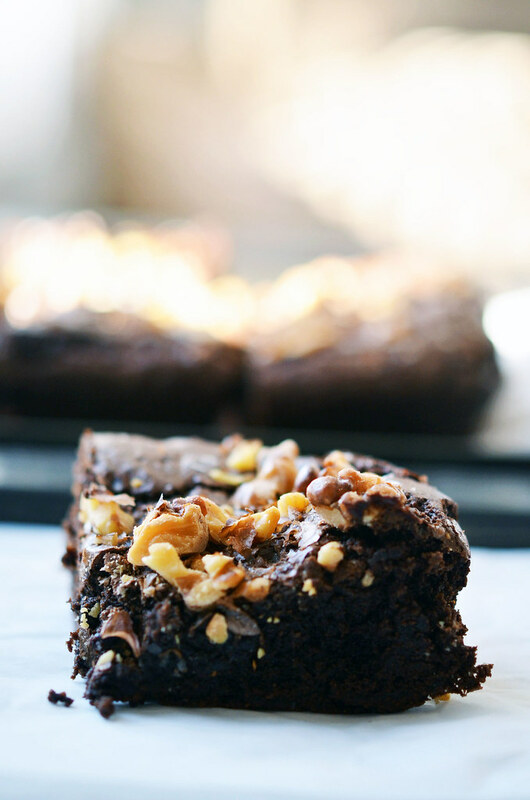 – Do not feel obligated to top these brownies with roasted walnuts and Maldon salt. I have often gone the route of a frozen 3 Musketeer Bar crushed and broken to bits and pieces and scattered about. Or slivered almonds and chocolate chips. Or simply plain jane, leaving ample room for a scoop of coffee ice cream and a dollop of hot fudge later in the evening. Top them or don’t. It is your adventure. Preheat oven to 350F. Cut 2 long pieces of parchment paper to fit into an 8 x 8 baking dish so a bit hangs over the edges on each side. Lightly spray with non-cooking spray. Set aside. Melt chocolate and butter in heat proof bowl placed over a pan of almost simmering water. Do not let the bowl touch the simmering water. Stir occasional. Or melt in a microwave safe bowl and heat for 30 seconds on 50% power, stirring between each heating cycle. Remove from heat and whisk in cocoa powder until smooth. Set aside to cool. Whisk together eggs, brown sugar, vanilla extract in a medium bowl until well combined. Add flour and salt and with a wooden spoon, stir until just combined. Pour batter into prepared pan. Sprinkle with roasted walnuts and flaky sea salt. Bake for 30 to 35 minutes until slightly puffed and toothpick when inserted comes out with a few crumbs. The top will no longer be shiny. Remove from oven and let cool completely before cutting into 9 fanatically large brownie squares. adapted from Baking Illustrated with a bit of help from Joy the Baker.